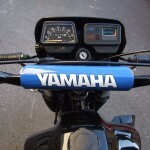 Restored 1984 Yamaha DT125LC Motorcycle. 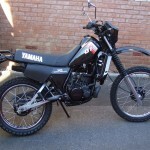 This Yamaha was restored to a very high standard by its owner. 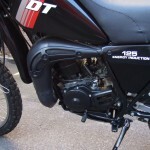 The engine was rebuilt by a motorcycle engineer. New bearings were installed including the big and small ends. The cylinder was re-bored to first oversize and fitted with a new quality piston and rings. Everything checked for tolerances and the correct Yamaha threebond jointing compound was used on the crankcase halves. The complete exhaust was repainted with the correct satin black high temp paint. 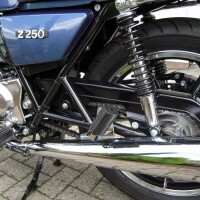 A new rubber joint was fitted between the two exhaust sections. The DT was taken right back to the frame. The frame was then soda blasted and powder coated gloss black. 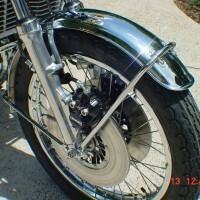 The swing arm was also soda blasted and painted the correct silver. The pivot bushes were checked, greased and refitted. The loom was checked through and all connections cleaned and checked. It was then correctly refitted and all of the electrical ancillaries were checked and reconnected. A new old stock rear chrome wheel rim was laced with new stainless steel spokes. The rear hub was stripped back and repainted satin black. New rear wheel bearings were fitted. The forks were stripped and the stanchions sent away to be checked for straightness. The chrome on the stanchions was deemed excellent so the forks were rebuilt with new seals and oil. The plastic bash plate under the engine which is often missing was excellent so was restored and resprayed with satin black as per original finish. A new old stock black headlight cowling was sourced at great expense and fitted with a new black decal with the correct white ‘Yamaha’ logo. New front indicators were fitted. The petrol tank finish was weathered and scratched so the tank was stripped, primed and repainted black. 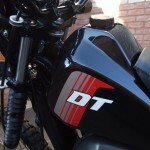 The the correct ‘DT’ decals were applied and the tank was then sprayed with four coats of 2K lacquer. The radiator cowling was also treated to gloss black and 2K lacquer at the same time so they match perfectly. 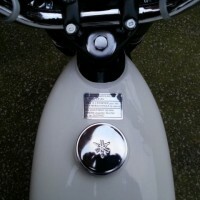 The original Yamaha side panels were excellent so were polished and the correct decals applied. The seat was treated to a new cover. 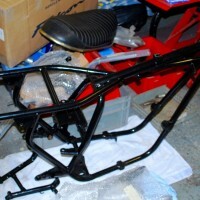 The rear carrier rack was stripped and repainted in gloss black. New brake pads were fitted front and rear. The handlebars were repainted gloss black. All of the switchgear was stripped, cleaned and rebuilt. 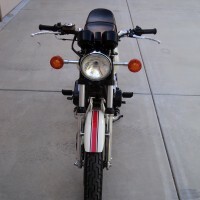 A really well restored Yamaha DT125LC Motorcycle. 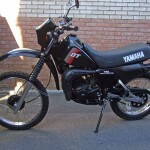 Yamaha DT125LC – 1984 For Sale or Wanted? 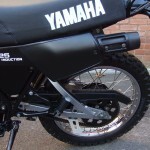 If you're looking for the perfect Yamaha DT125LC – 1984 for sale then take a look at the hundreds of restored classic motorcycles listed on our extensive Motorcycles For Sale pages. 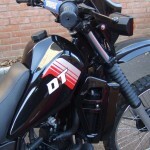 We regularly feature very nice restored Yamaha DT125LC – 1984 bikes for sale. 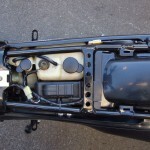 Spares and Parts for your Yamaha DT125LC – 1984? 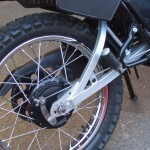 Workshop Manual for your Yamaha DT125LC – 1984?